aTLANTA — On what turned out to be the decisive play of Super Bowl LIII, Los Angeles Rams coach Sean McVay went to what he knew. And much to the Rams’ misery, so did the New England Patriots’ defensive masterminds, Bill Belichick and Brian Flores. Down only seven and facing a second-and-10 at the Patriots’ 27-yard line with a little over four minutes left in the fourth quarter, McVay called up his trusty “11” — or three-wide personnel — and called a passing play that sent his best deep-ball threat, Brandin Cooks, on a “go” route in single coverage. There was just one problem. Rams quarterback Jared Goff had been flustered by the Patriots’ excellent assortment of well-timed, well-executed and well-schemed blitzes and d-line stunts all night, and with the game hanging in the balance, Flores sent the best of those pressures — an all-out blitz with single coverage across the board. 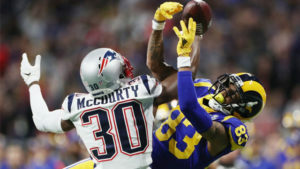 The Rams ended up having the same number of blockers as the Patriots ended up bringing, but it mattered little as Goff — who was seeing ghosts all night due to the Patriots’ ability to keep him off balance — decided to heave the ball, off his back foot, into a jump ball situation to the 5-foot-10 Cooks against the Patriots’ 6-1 All-Pro cornerback, Stephon Gilmore. When Gilmore came down with the ball, essentially cementing a 13-3 win, one could argue it was not only a win for the Patriots — who won their sixth Super Bowl in 19 seasons — but for defenses, in general. It’s kind of funny, actually. For all the talk about how this season exemplified The New NFL, with the accumulation of rule tweaks over the past several years essentially allowing even below-average quarterbacks to be average, fans who were hoping to tune into a high-scoring Super Bowl were treated to the exact opposite, a defensive slugfest spurred by defensive masterminds on both sides. Yet, while plenty will rush to call it a boring game, those who appreciate the chess match of the principals involved — the small delegation of football nerds in the crowd — would certainly disagree. What the Patriots did to Goff and the NFL’s vaunted second-ranked offense Sunday night was possible only due to the execution of one of the best defensive Super Bowl game plans in years. “It was amazing,” Patriots safety Duron Harmon admitted. The foundation of the Rams’ offense is the outside zone run. But with their star running back, Todd Gurley, limited for whatever reason, the Rams have been relying on 235-pound sledgehammer C.J. Anderson of late. And while Anderson is a load to bring down, he is decidedly less effective on those outside zone plays. So when the Patriots controlled the line of scrimmage, thus limiting Anderson’s ability to pound up the middle — and with Gurley unable to shoulder enough of a load to make them pay on the outside zone — it lead to the Rams, who finished with the third-ranked rush offense, ending the game with a piddling 62 rushing yards. “They did a really good job of playing us with six on the line all day and limited the space to be able to get the runs through there,” Rams left tackle Andrew Whitworth said. This, obviously, left Goff’s right shoulder as the Rams’ only recourse. But unlike other quarterbacks who have successfully counteracted the Patriots’ stellar game plans with a unique playmaking knack — see: Kansas City Chiefs quarterback Patrick Mahomes in the AFC championship game — most of Goff’s best downfield shots all season have been schemed up by the 33-year-old McVay, whose creative plans often allow Goff to throw to spots instead of going through tons of reads. The Patriots took away most of those easy shots Sunday by wiping out those concepts with more zone coverage than normal — which isn’t typical for a team that had been press-man heavy all season. And with Goff confused and the Rams unable to regularly execute their play-action plays that the Patriots also wiped out, that left the third-year pro as a sitting duck in the pocket, as the Patriots used unique blitz packages and well-executed defensive line twists to rack up four sacks and 12 quarterback hits. In all, the Patriots’ marriage of game plan and execution added up to sterling performance in which they held the Rams into a tie for the fewest points scored by a team in Super Bowl history. Aside from the players, of course, credit for that should go to Flores, who is listed as the team’s linebackers coach but called the plays against McVay, a bright, young coach whose early success has led several teams to hire young, offensive-minded head coaches just like him. Lost in the Patriots’ win will be the performance of the Rams’ defense, which was pretty darn good, too. Defensive coordinator Wade Phillips put together an outstanding game plan, one in which the Rams clamped down the Patriots’ rush offense early, clogged the middle of the field and forced the 41-year-old Brady to hold the ball longer in the pocket, forcing him to absorb more punishment than he’s used to. But in the second half, the Rams’ rush defense wore down, the Patriots started picking up pressure better — Los Angeles sacked Brady only once and hit him four times total — and Brady ended up directing a go-ahead scoring drive with seven minutes left. This set up the Rams’ penultimate offensive drive, one that ended with a Gilmore interception that turned out to be a tidy microcosm for a game in which the Patriots’ defensive coaches remained a step ahead of McVay. By the time it was all said and done, the Rams were forced to come to grips with not only that fact, but this one, too: For all the points that were scored this season, for all the yardage that was rolled up, the biggest game of the 2018 NFL season was ultimately decided by a side of the ball that had been left for dead, thanks to two spectacular game plans that probably delighted only football dorks.